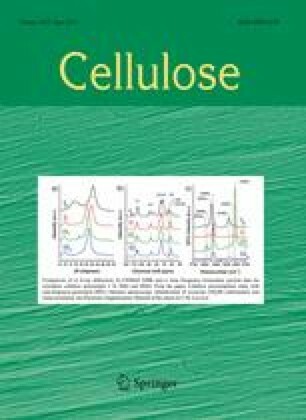 The present study reports a simple method to control the mechanical and surface properties of cellulose fiber networks and to protect them from humidity, without altering their initial morphology. This is achieved by dip coating the fiber networks in solutions containing different amounts of ethyl cyanoacrylate monomer (ECA). Under ambient humidity and due to the presence of the -OH groups of the cellulose, the ECA polymerizes around each individual cellulosic fiber forming a thin poly(ethyl cyanoacrylate) (PECA) shell. PECA was found to interact with the cellulose surface via hydrogen bonding as evidenced by Fourier transform infrared spectroscopy and thermogravimetric analysis measurements. The detailed surface characterization reveals that only 3.5 wt% of ECA in solution is sufficient to form compact PECA cladding around every cellulose fiber. After the proposed treatment the cellulose sheets become hydrophobic, well protected from the environmental humidity and with increased Young’s modulus. The online version of this article (doi: 10.1007/s10570-013-9900-z) contains supplementary material, which is available to authorized users.